This blog aims to be a gentle reminder to take media reports on the topics of fitness and nutrition with a grain of salt. I had dinner with a good friend last night, a doctor of palaeontology and we got discussing how the media reports academic and scientific studies. My friend confirmed what I had witnessed through my own studies, that more often than not the media will adapt the essence of academic studies in order to make ‘entertaining’ news. Sadly this is reality – like any other profit driven organisation, their interests are ultimately about selling their product (newspapers) and not informing the public with complete and accurate information. 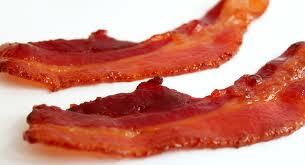 The Age published an article on 15 October with the title, “Bacon lowers sperm count, fish improves it”. The article goes on to discuss a Harvard University study that examines how diet affects the size and shape of sperm. What you will find if you dig a little deeper into this story is that the study found that men who ate processed meat more often had lower sperm count than men who ate less processed meats. This is an important difference to what is suggested in the title of The Age article. Bacon is one type of processed meat, however, the interesting finding from this study is that a higher consumption of processed meats in general, reduced sperm count in males. What is a commonality in processed meats on the market? Preservatives. Nitrates. Bacon doesn’t need to contain these ingredients, and if you do some looking around you will find quality butchers around the country who sell preservative and nitrate free processed meats that are perfectly healthy and good for you. I have organic sausages custom made for me by my local butcher. They are preservative free, gluten free, grain/starch free, and nitrate free. They only last 3-4 days in the fridge, which is the way meat should be. If you buy a sausage that has a shelf life of more than that, you should seriously question if you really want to eat that ‘food product’. I also buy organic preservative free and nitrate free bacon from my local butcher – it’s a bit more expensive than ‘normal’ bacon, but I value my body, I value my health, and I value my sperm!